-I've read some positive reviews for this book. It looks super-cute. I loved this one. It's huge so be prepared. . . So excited for this one!! Its getting closer to the release date finally! I've been looking forward to this one for awhile. I love fairy tale re-tellings! This book is also on my TBR list. The cover was the first thing i noticed but to make all things better the synopsis sounds really good too. I'm waiting on this one, too! I'm happy it comes out soon. Lovely cover and story. How can it not be good...beautiful gowns, dashing suitors, and balls filled with dancing are taken away from the protagonist. Then she's locked away! Count me in! That dress is just so beautiful. I can't wait to read the book. You can see what I'm waiting for at The Bookish Snob Happy reading! I haven't heard of this one but it sounds great, definitely one that I will be adding to my pile. Found various review about it, but I still wanna read it. I've read two retellings of this story that I've liked (Wildwood Dancing by Juliet Marillier and Princess of the Midnight Ball by Jessica Day George). This one sounds good too. Great pick! I am excited about this book too as I love fairy tale retellings. Good pick! Seen this one around lately. It has a beautiful cover! What an awesome cover! And I love the main character's name...Azalea. Enjoy! I love the cover. It is so gorgeous. I can't wait to read it, it looks so good. At least we don't have to wait that long before it comes out! I hope when you get it, it will be everything you hope it to be. Check out what I am Waiting On Wednesday for. I've read some good reviews of this one too. Love that cover! Fabulous choice Alison, I really enjoyed this one! I liked that it focused so much on family and then had just a touch of romance, it was a nice combination:) Can't wait to see what you think of it! 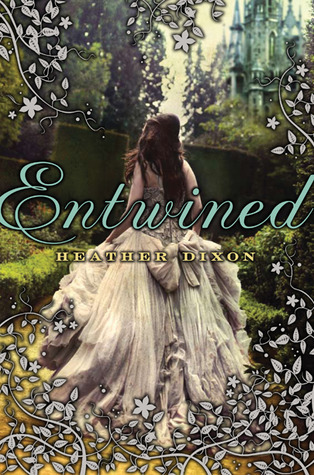 I really, really, really can't wait to read Entwined! It sounds really awesome, and that cover is just gorgeous! I can't wait for this one! I'm even more anxious for it after reading a few positive reviews. It's so big though! I've heard a lot about this book and I'm super excited to read it. Its on my TBR! Fairytale retelling and gorgeous cover! I hope the book doesn't disappoint cause I know someone who couldn't even finish it :/. I'm reading this one and am LOVING it! It is large, so have lots of time on your hands when you start this because you won't want to let it down! I'm so so so so so so excited for this one! I keep drooling and drooling and drooling over it. Is it the 29th yet? This one is on my list as well!! I can't wait for this one either! It sounds so good! Plus, who can resist that cover? Gorgeous! Good choice. I've been wanting to read this since I first saw it. Don't you just love the cover? It's so pretty.